After Tom Wolfe defined the '60s in The Electric Kool-Aid Acid Test and Radical Chic and Mau-Mauing the Flak Catchers and the cultural U-turn at the turn of the '80s in The Right Stuff, nobody thought he could ever top himself again. In 1987, when The Bonfire of the Vanities arrived, the literati called Wolfe an "aging enfant terrible." He wasn't aging; he was growing up. Bonfire's pyrotechnic satire of 1980s New York wasn't just Wolfe's best book, it was the best bestselling fiction debut of the decade, a miraculously realistic study of an unbelievably status-mad society, from the fiery combatants of the South Bronx to the bubbling scum at the top of Wall Street. Sherman McCoy, a farcically arrogant investment banker (dubbed a "Master of the Universe," Wolfe's brilliant metaphorical co-opting of a then-important toy for boys), hits a black guy in the Bronx with his Mercedes and runs--right into a nightmare peopled by vicious mistresses, thin wives like "social x-rays," slime-bag politicos, tabloid hacks, and Dantesque denizens of the "justice" system. 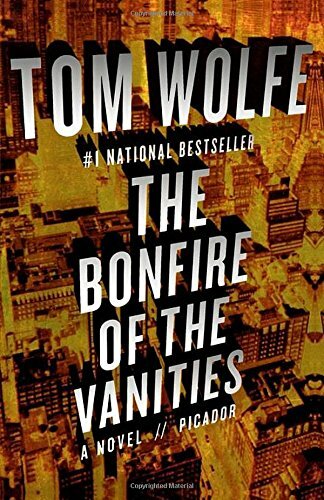 If the Coen and Marx brothers together dramatized The Great Gatsby, Wolfe's Bonfire would probably be funnier. Many think his second novel, A Man in Full, is deeper, but Bonfire will never die down.